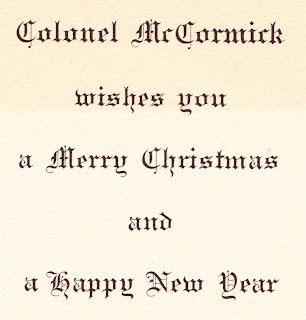 This Cantigny Farm Christmas card from Robert Rutherford "Colonel" McCormick was issued prior to 1955 (as McCormick died in April 1955). The 500-acre tract, located west of Chicago, was the country estate of publisher/politician Joseph Medill in the 1800s. Medill's name for the estate was Red Oaks. After Medill's death in 1899, Red Oaks was passed to McCormick, his grandson. "Bertie" McCormick (1880–1955) spent the early part of his being raised in London, working as a lawyer and serving as editor and publisher of the Chicago Tribune. He worked as a war correspondent for the Tribune early in World War I, but then returned to the United States and joined the Illinois National Guard in 1916. 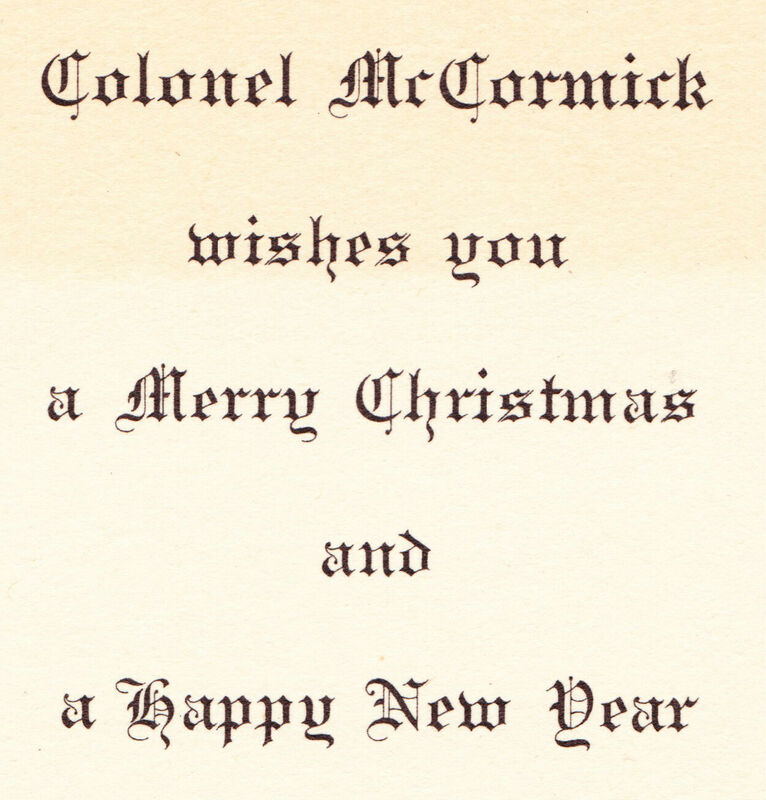 By 1918, he was a full colonel in the field artillery for the U.S. Army. In May 1918, he took part in the Battle of Cantigny, the first American offensive of the Great War. The attack was a success, but at the cost of 1,600 casualties (including 199 killed) for the Americans. The battle left a lasting impact on Colonel McCormick, who changed the name of Red Oaks to Cantigny Farm after returning home. After his death in 1955, Cantigny was transformed into a public park. And that's what it remains today, as part of the Robert R. McCormick Foundation. The 500-acre park features gardens, two museums (the Robert R. McCormick Museum and the Cantigny First Division Museum), a golf course, a playground, hiking paths and more. Colonel McCormick and his first wife are buried on the grounds. The park and museums will be closed on Christmas Eve and Christmas Day. 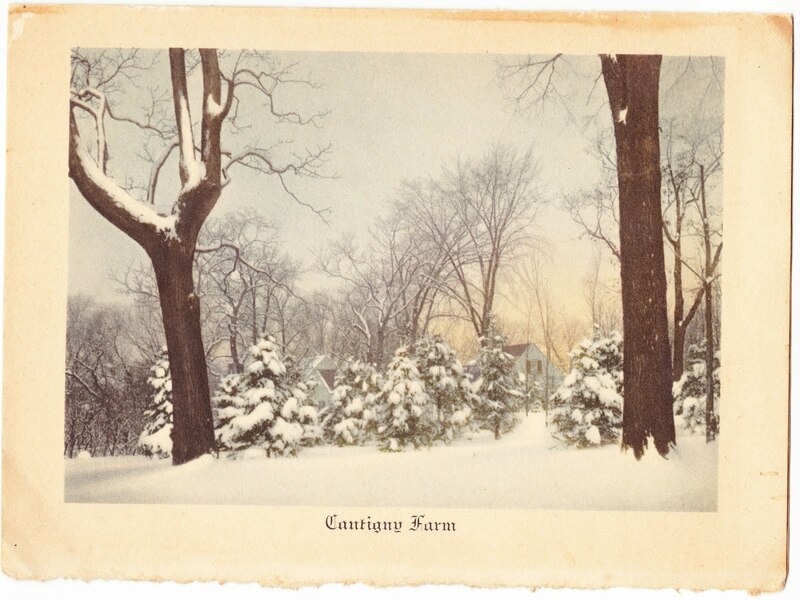 You can read more about Cantigny Park's history on the official website.